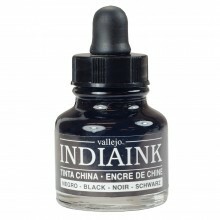 Indian ink has been used for thousands of years. It is made of lamp black pigment suspended in a binder. Today indian ink is available in a solid stone or as a liquid. For use with brush or pen.